It's time for HAUNTED HIKE! 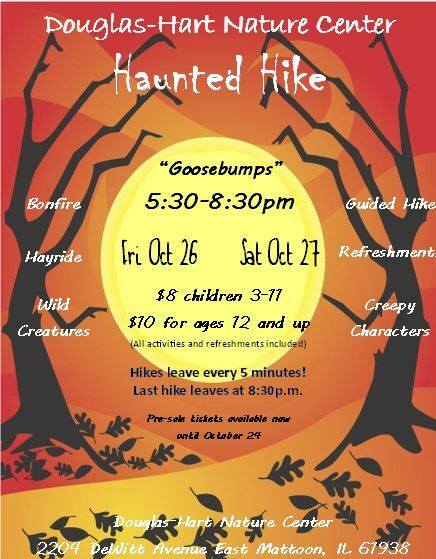 Douglas-Hart is seeking 100+ volunteers each evening of Haunted Hike to create a fun, spooky experience. Youth under 13 must volunteer with an adult. Families, groups, couples, and clubs are invited to sign up and scare together! Sign up to help one or both nights! Costuming, PIZZA, and training included. Volunteer stations include many costumed characters, special effects, admissions, refreshments, and more. Contact the volunteer coordinator to learn more or sign-up…… if you dare!! Nature Center right away to secure spots together! Transportation from/to EIU can be arranged by advanced request. Contact volunteer coordinator Nicholas Polston! Just use the button above to view our open stations on Signup.com, and sign yourself up to participate in Douglas-Hart's most anticipated event of the year! Or view the open stations below and call the Nature Center to secure your spot!